Our hike is called Rim to Rim to Rim, or R2R2R. We hike approximately 50 miles, crossing the Canyon in a single day each direction, with a day of rest in the middle. Historically, most of the first time hikers will only hike one direction, R2R, and that is an amazing feat. The South Rim is the tourist attraction, holds several hotels, and is 80 miles away from Flagstaff. It is high desert terrain, and beautiful. 11 miles straight across, is the North Rim. It is a remote place that is 1,000 feet in elevation higher than the South Rim. There is only one road in and out of the North Rim, and there is only one lodge. It takes about 5 hours to drive from the South Rim to the North Rim, winding through the Navajo Indian Reservation. The North Rim is quiet and the sky is so inky black you can often see the Milky Way at night. There is only one lodge and one restaurant, so you must have a room reservation and if you miss your meal time you go hungry. Temperatures at this higher altitude often mean a change in the weather. In GC 2010 we awoke to find an inch of fresh snow on the ground IN JUNE and we hiked in snow for the first 3 hours so while you train for the heat and educate yourself on heat related illnesses, also come prepared for freezing temperatures and know how to treat hypothermia. We stay two nights at the North Rim, to truly enjoy it. We go in the late spring/early summer to try to avoid deadly high heat at the bottom, but it is consistently over 100 at the bottom and all hikers must train and prepare for extreme conditions. Our boots hit the train no later than 3 AM to get through the box canyon at the bottom (2,000 foot high granite walls that cook you if you happen to be in that 7 mile stretch with the sun overhead). I have been in the Box at 124 degrees after a late start and it was very dangerous. We coordinate rental cars/vans and split those costs and gas evenly amongst the entire group. There will be at least two luggage vans to takes the hiker’s luggage to the other Rim on the day they hike. Sometimes we need drivers for the vans, and all hikers should be prepared to drive one direction if needed. The first thing to do is to get rooms. “Forever Resorts” that runs the Grand Canyon North Rim Lodge. 1.877.386.4383. They will want you to pay one night’s rate at the time you reserve, but you can cancel with a refund up to 48 hours in advance. Then, they next step is to get rooms on the South Rim. Xanterra runs the South Rim, 1.888.297.2757. That is the number for the main switchboard, and they can book at any of the hotels. The El Tovar is the oldest, nicest, historic one on the Edge ($250). The El Tovar has the best food and a back porch with a heck of a view and plenty of cold adult beverages for post-hiking success stories. Also on the Edge but less expensive are the Bright Angel Lodge, Kachina and the Thunderbird ($180). The Yavapai is too far away for our shuttle plans and no hiker should stay there. The challenges of the hike include altitude and temperature changes over an extended period of time. 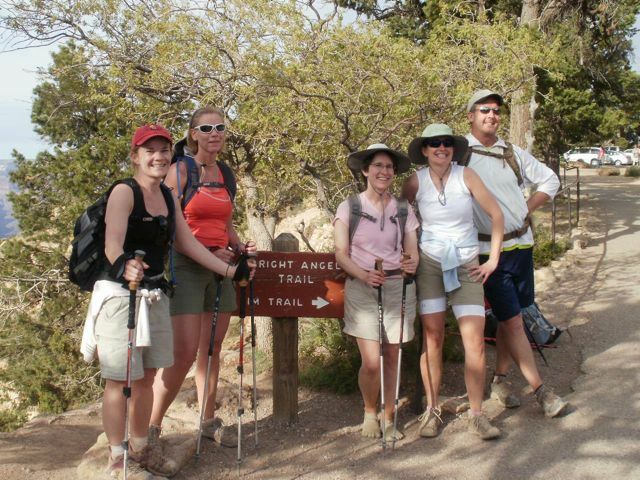 You will hike for anywhere from 8 to 14 hours each day, depending on your physical abilities and the weather. It is a long day. It will be 30 to 40 degrees when we start, we will hit over 100 degrees at the bottom (which can be 20 to 30 degrees hotter in the sun), and then back to 30 or 40 degrees on the Rim. You climb up and down hundreds of feet while on the “flat” part at the bottom, but the climb up and out is over a vertical mile high. Read the page on Training Tips for more information and our opinions on the challenges of this hike. Climbing out the North Rim is 1,000 feet higher than climbing out the South Rim. The trail is not smooth, rocks and trees have been placed in the trail to help with erosion, etc, and these are big steps. You will continually be stepping up and over objects when you go into and exit the Canyon, no matter what direction you hike. The altitude alone makes people sick and makes the hike out difficult. The way down is extremely hard on the knees, the impact is hard to train for but we have learned if you take it easy on the way down you somewhat salvage your knees and feet for the way out.Preparation and serious training probably begin with a medical physical exam with a stress test, so you know if you have any problems. Hikers are responsible for their own health and safety, I am not. Hikers are in charge of their own lives and training, and unfit and unprepared hikers put everyone’s lives at risk. People die at the Grand Canyon every year. You are your own rescue, there is no quitting if you are hurt or tired. This is no comfy marathon where someone hands you a dixie cup every mile and you can take a cab back to your hotel if you want to stop. There is no 911 to call (your phone won’t even work down there), and I have seen seriously injured people hiking themselves out who required hospitalization. It is not a place to be in poor health, hurt, without training, or without food and water. There are no guides and no 911 assistance. Medical assistance and rescue from the Park Service is not something to rely on, you basically must be dying to get rescued and unpredictable heat and wind conditions prevent helicopters from entering the Canyon for DAYS at a time. I have heard there is only one location on the North trail where a helicopter may even land (although I have never seen one), so we are remote and on our own. There are no rescue phones, your cell phones won’t work in the canyon, and your GPS won’t work. We never, ever, hike alone or leave anyone behind by themselves. We have seen the confusion, vomiting, and side effects of heat exhaustion and altitude sickness that make this a dangerous place. We also never, ever get on ledges and take “funny” falling photos. Too many people have died that way, there is an entire book dedicated to the hundreds of people who have died in the Canyon in these manners over the last hundred years. I want all my friends to experience this but I also warn everyone that this hike is extremely difficult both physically and mentally. The reward is hard earned and the journey is amazing, but this is also a personal trip and you have to train. You must educate yourself by researching on your own what to expect hiking in the Grand Canyon. High altitude, high heat, low humidity, temperature swings, flash floods, dangerous desert animals and insects, heat exhaustion and heat stroke, water intoxication, hypothermia … is just the beginning of the things you will need to understand.